On April the 7th. 1945 (Good Friday), the Polish soldiers had to take leave of their guest-families, in which they had lived for almost five months. It was a good-bye with mixed feelings, for instead of a period of rest, the winter of 1944/1945 had become an exhaustive period with many dead and wounded comrades. Added to this was the fact, that in February 1945, during the Conference of Jalta, it had become clear, that Poland came into the Russian influence-sphere, so a march to Warsaw wasn't possible any longer. On April the 7th. the 1st. Polish Armoured Division was placed under the command of the 2nd. 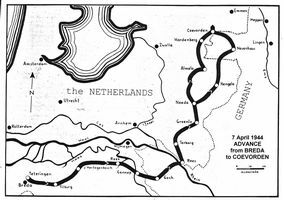 Canadian Armycorps and General Maczek was ordered to move to Coevorden as fast as possible. The journey started from Breda and surroundings via Tilburg, 's-Hertogenbosch, Reek to Gennep, where they crossed the river Maas. Then they travelled via Goch to Rees, where they crossed the river Rhine by means of a temporarily built Bailey-bridge. Then they drove via Terborg, Groenlo and Neede by different routes to Coevorden. 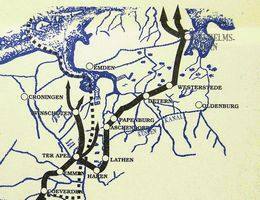 At Coevorden they started the first reconnoitrings in the direction of Emmen; after which ten strenuous days began on Dutch soil. The 1st. Polish Armoured-division was divided into 2 columns. The left column liberated the region into Northern direction as far as De Dollard (a sea-arm of the Northsea). The towns of Ter Apel and Winschoten were liberated among others. Near Ter Apel the right column turned off in Eastern direction and started an attack on the North of Germany; which attack ultimately led to the capitulation of the Germans in Wilhelmshaven. Polish dragoons look for shelter behind a pile of peat. Peat was won on a large scale in this region these days. 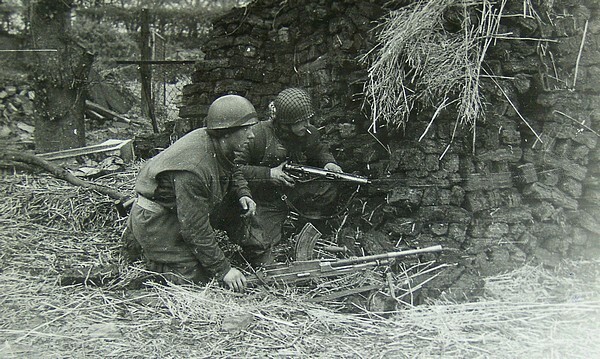 Because of the march to the Northsea, the last connection with the German troups in the West of Holland was cut down. The other column threatened the important German harbours, so that supply across the sea had become impossible. The price was high and after the liberation of this part of North-East Holland, 45 Polish Wargraves were found there. These graves were scattered across the whole region. When, in 1962, a central Polish Field of Honour was founded, all these graves were exhumed and transported to Breda. Only Bernard Grabowski's grave remained behind - it is still on the burialground at Tange. Moreover, Teofiel Malkowski's grave on the Roman Catholic Cemetery of Winschoten, wasn't to be found there. Rumours say, that this grave has been transported to France in an illegal way. "Memento Kazimierz Zalcer & Jan Dobras" written in the Polish, English and Dutch language by Dietert Grimmius. Published in 1998 by "Stichting Nieuwolda" and the Municipality of the town "Nieuw Scheemda". "Vlucht zonder thuiskomst" written by Dietert Grimmius. Published in 1995 by the Municipality of the town of Delfzijl, the Netherlands. "Herinneringen aan Bourtange" Author R. Nobbe. Published in 1995. "mobilisatie, collaboratie, liberatie" Author Hans Onderwater. Published in 1977 by the author ISBN 90-70-17-1015. "THE SOLDIERS OF GENERAL MACZEK IN WORLD WAR II"